Looking at luxury cars is fun no matter who you are. Even if you're not in the market for a luxury sedan yourself, there's plenty to get excited over just looking at these beauties. And even if you don't care about horsepower numbers, the luxury features of today are the standard features of tomorrow, so you can start looking now at what to expect if you plan to buy a car a year or two down the road. 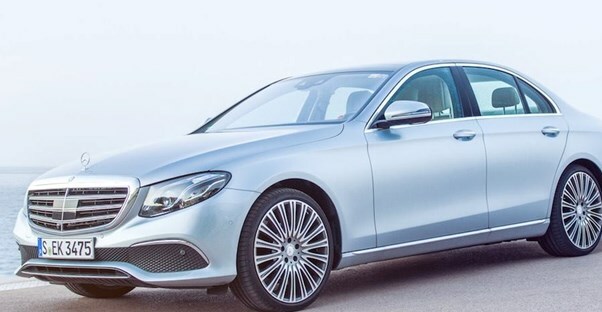 The Mercedes-Benz E-Class isn't a sporty car by any stretch of the imagination. But that's alright. The CTS can have the sportiness crown; the E-Class is all about comfort. The sedan model starts at $52,950. For that, you get a 2.0L inline-4 turbo engine with 241hp that reviewers say is smooth and powerful. Drivers will find crosswind assist, PRE-SAFE Sound that protects your ears with pink noise in a collision, rain-sensing windshield wipers, and what Mercedes refers to as "sensual purity of design." That sounds a little pretentious, but it's also sort of hard to argue with. Blind spot assist, active steering assist, surround view system, and other advanced safety features are also available as options. The Audi A6 is a Car and Driver editor's choice, an A-rated Edmund's pick, and just an all-around fantastic luxury car. A 252-hp, 2.0-liter turbo four-cylinder comes standard at the base MSRP of $49,700, with the option to upgrade to a supercharged 3.0-liter V6. Both give a good balance of power and fuel economy—the base model four-cylinder gets 23mpg city/34mpg highway. The roomy interior features more fine-tuned craftsmanship even compared to last year's model. Optional safety features, like adaptive cruise control and automated emergency braking, are optional. There's plenty of tech to go around. And this year, unlike last, Apple CarPlay and Android Auto compatibility are offered standard on the base model. The base model of the BMW 5-Series, the 530i sedan, has an MSRP $53,400 that nets you 2.0L twin power turbo inline 4-cylinder engine capable of 248-hp and 0 to 60 mph in six seconds flat. It also comes with a HiFi Sound System featuring 12 speakers and 205-watt digital amplifier. On the tech side is one notable feature that you won't find anywhere else. The BMW 5-Series is one of the first offering a wireless version of Apple's CarPlay smartphone integration. Until now, drivers who used CarPlay had to physically plug their phone into their vehicle. The 5-Series allows phones to connect wirelessly, similar to using Bluetooth, but beware! The downside is that it uses up your phone's battery pretty quickly. If you're willing to splurge for upgrades, that won't be a problem, however. An available wireless charging pad is offered that mitigates the battery drain. Also of note, after a year, the wireless CarPlay feature becomes a paid premium. With a base model MSRP of $41,750, the Genesis G80 will initially draw eyes from those who want the feel of a luxury car at a price they can afford. But once those bargain hunters see this car's spacious, quiet interior, they'll be glad they took a look. Leather seats offer three levels of heating and cooling. A 3.8-liter V6 delivers 311 horsepower to carry you along, and a suite of standard safety features. These include lane keep assist, blind spot detection, a smart cruise control radar, and automatic emergency braking. All features work together to keep you secure while it carries you down the road. Options include a 9.2-inch HD touchscreen navigation display and a 17-speaker surround sound audio system. Honestly, by the time you've decked out the G80, you're in the neighborhood as the base model for other luxury mid-size cars. The big drawback is the weight, which detracts from both the acceleration and the fuel economy (19 mpg city/ 27 mpg highway). This isn't necessarily the top performer, but you get an incredible amount of car for the price! The Cadillac CTS has been a popular favorite for a while now. The CTS starts at $46,495, which gets you a 268-hp 2.0L turbo engine. However, you can upgrade to a 335-hp 3.6L V6 engine or even a 420-hp twin-turbo V-6 with the V-Sport model. The base model gets 22 mpg city and 30 mpg highway. Reviewers have found this a bit lacking compared to other cars or even the CTS's other engines. Still, the car handles extraordinarily well at any trim level. It also comes with features like precision tailored interior materials, 20-way heated and ventilated front seats, and tri-zone climate controls. Tech upgradable options include a massive 12.3-inch display, a heads-up display that projects information onto the windshield, and "Magnetic Ride Control" that adjusts the suspension according to road and weather conditions.